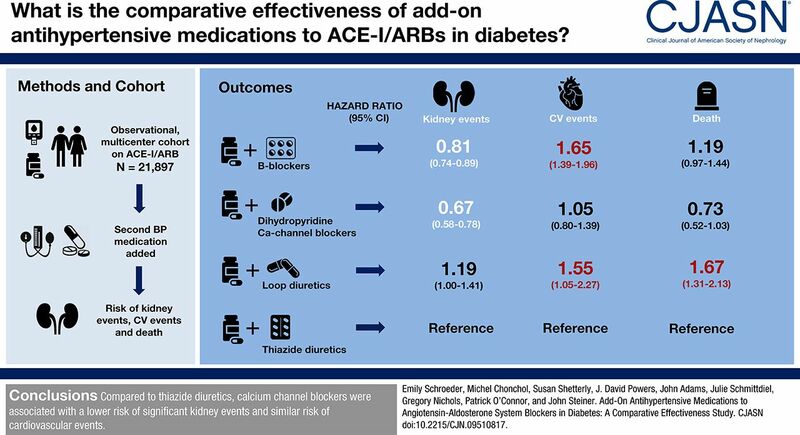 Background and objectives In individuals with diabetes, the comparative effectiveness of add-on antihypertensive medications added to an angiotensin-converting enzyme inhibitor or angiotensin II receptor blocker on the risk of significant kidney events is unknown. Design, setting participants, & measurements We used an observational, multicenter cohort of 21,897 individuals with diabetes to compare individuals who added β-blockers, dihydropyridine calcium channel blockers, loop diuretics, or thiazide diuretics to angiotensin-converting enzyme inhibitors or angiotensin II receptor blockers. We examined the hazard of significant kidney events, cardiovascular events, and death using Cox proportional hazard models with propensity score weighting. The composite significant kidney event end point was defined as the first occurrence of a ≥30% decline in eGFR to an eGFR<60 ml/min per 1.73 m2, initiation of dialysis, or kidney transplant. The composite cardiovascular event end point was defined as the first occurrence of hospitalization for acute myocardial infarction, acute coronary syndrome, stroke, or congestive heart failure; coronary artery bypass grafting; or percutaneous coronary intervention, and it was only examined in those free of cardiovascular disease at baseline. Results Over a maximum of 5 years, there were 4707 significant kidney events, 1498 deaths, and 818 cardiovascular events. Compared with thiazide diuretics, hazard ratios for significant kidney events for β-blockers, calcium channel blockers, and loop diuretics were 0.81 (95% confidence interval, 0.74 to 0.89), 0.67 (95% confidence interval, 0.58 to 0.78), and 1.19 (95% confidence interval, 1.00 to 1.41), respectively. Compared with thiazide diuretics, hazard ratios of mortality for β-blockers, calcium channel blockers, and loop diuretics were 1.19 (95% confidence interval, 0.97 to 1.44), 0.73 (95% confidence interval, 0.52 to 1.03), and 1.67 (95% confidence interval, 1.31 to 2.13), respectively. Compared with thiazide diuretics, hazard ratios of cardiovascular events for β-blockers, calcium channel blockers, and loop diuretics compared with thiazide diuretics were 1.65 (95% confidence interval, 1.39 to 1.96), 1.05 (95% confidence interval, 0.80 to 1.39), and 1.55 (95% confidence interval, 1.05 to 2.27), respectively. Conclusions Compared with thiazide diuretics, calcium channel blockers were associated with a lower risk of significant kidney events and a similar risk of cardiovascular events.